Darwaza-i-rauza is one of the components of the Taj Mahal complex, with the mausoleum, the mosque and the guest pavilion. It is the gateway to the gardens which, symbolically, represents Paradise. It is also called the "Great Gate". 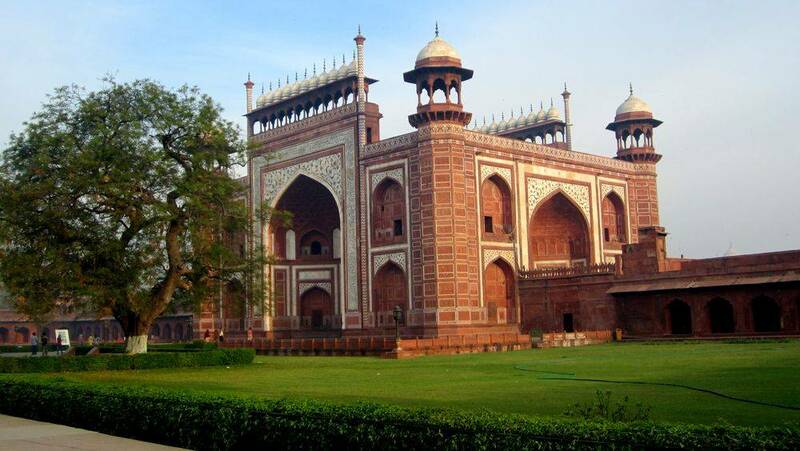 In practice Darwaza-i-rauza is a rectangular building of 41.20 x 34 m and 23m high. 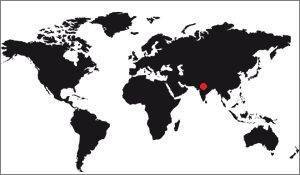 It is of great symmetry, crossed by two axes East-West and North-South. Externally it looks a little like a defensive building because it is flanked at each corner of an octagonal turret, narrow turrets, slender and ending above the roof by a chhatris (sort of colonnade kiosk surmounted by a typical dome). of Hindu architecture). The facades contain 5 iwans. An iwan is a ogile porch with a vault, very high and very wide but shallow and has the same meaning as the entry porches in the churches, namely that it is about a symbolic airlock before entering a holy place. On the 5 iwans, the central is very big, it's the main one. It contains 6 small openings, the real doors, aligned in 2 rows. The other 4 are purely decorative, they frame the main iwan. This arrangement is found on the 4 sides of the door, but the two faces North and South are wider. Their main iwans are higher, the facade has been elevated just above the door and is surmounted at this point in a series of 11 identical and contiguous chhatris, forming a gallery. We call it a "guldastas". This is an original architectural detail in Taj Mahal, we find nowhere else this arrangement of chhatris contiguous. This gallery is terminated by two arrows rising towards the sky, like stems that start from the ground and rise beyond any other architectural element of the great gate. The southern wall, which is in the inner courtyard, is made of a series of small identical rooms open on the courtyard, each room being separated from the others by columns, all forming a gallery. It was a market place for the poorest who came here to sell various goods sheltered from bad weather. There is not much to say about the materials used for the construction of the big door. 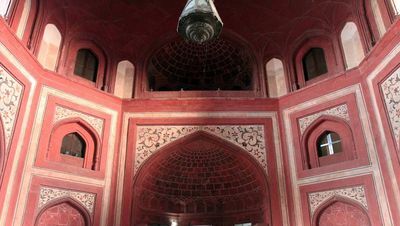 It was made of clay bricks, like all the buildings of the complex, and like the mosque it was covered with red sandstone. The inlays were made of white marble, hence the two-tone red-white appearance of the buildings. The inlays of Koranic texts are in black marble. The decorations on the main gate of the Taj Mahal are magnificent, but do not derogate from the rule for all other buildings in the complex, namely that they are either floral or plant motifs, or reproductions of verses of the Koran. Even their arrangements are identical to those of the mosque: The calligraphy of the Koran frame the four doors in three large bands of white marble inlaid with black marble. This technique of encrustation is called the Pietra dura and it is difficult to control, the emperor Shan Jahan had to bring Florentine craftsmen to realize them, it is they who popularized this art and who possessed the best workers. The text that is inscribed is an excerpt from the Quran, you have more detail on the page devoted to the calligraphic inscriptions of the Taj Mahal. The other decorations are representations of flowers or plants. 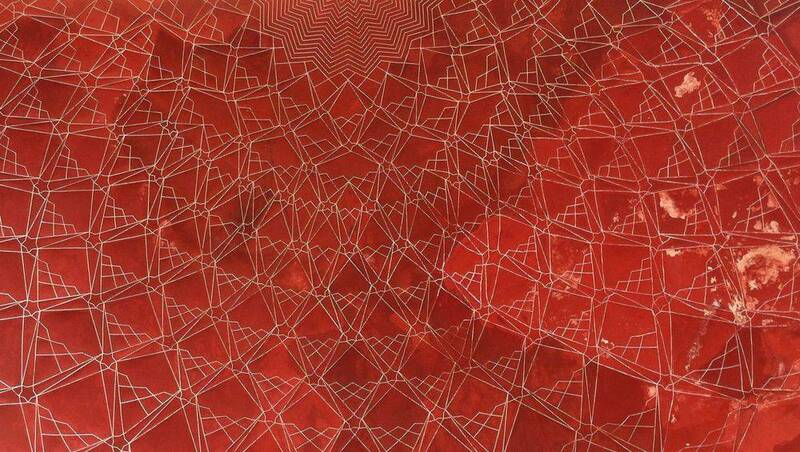 Some are stylized, others more realistic, and these patterns are sometimes invented. The idea was that the big door is the most beautiful possible, not that it represents the reality of life on earth, so the artisans were able to invent their own flowers if they wanted. 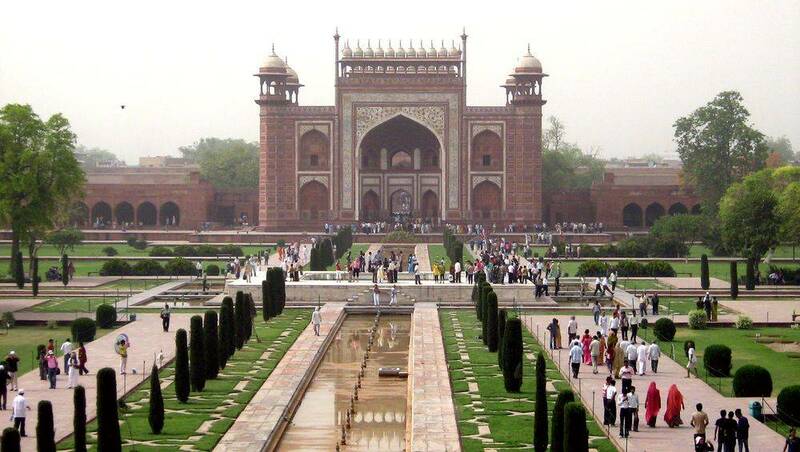 This was rare, as shown by the study of the plants represented on the Taj Mahal, but it did exist. If there are also geometric patterns on the main door, symmetry being the key word in Mughal art, it was logical that there should be. 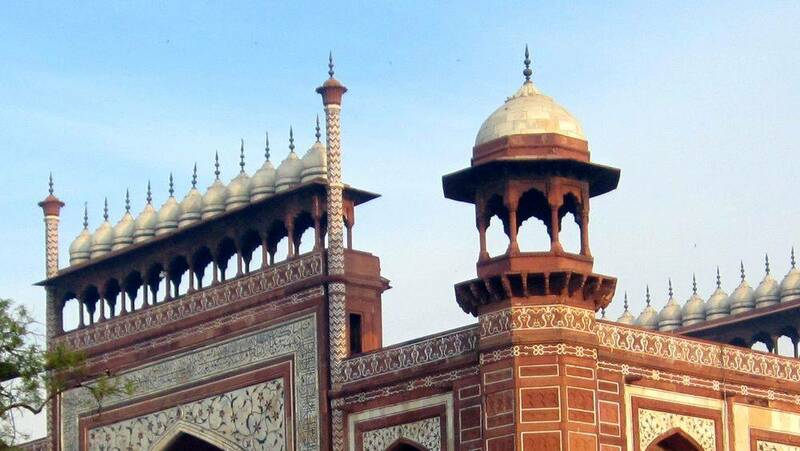 Again this is not original, there are such motifs on the mausoleum, the mosque, or the guest house. A remark on the calligraphic inscriptions: When we look at them we can read them without problem (for those who read the language). However, the visitor is up to man for the texts written at the bottom of the monument, but the texts above the door are several meters high, and yet we can read them as easily. This is due to the fact that the artist has written larger characters at the top than at the bottom, the size of the font increasing with the altitude of the text. This effect was of great intelligence and allowed everyone to read the Quran easily. The most emblematic verse is "O soul, you are at rest, return to the Lord at peace with him, and he at peace with you". It is the only one where the prophet speaks directly to a human. The caravanserai has disappeared today, overtaken by the urbanization of Agra. It was both the market and the arrival of caravans from other countries. 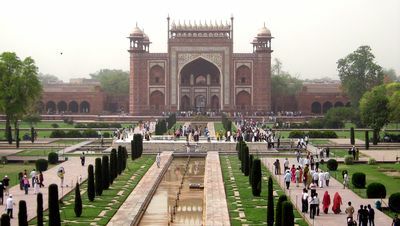 The inner courtyard was seen as a kind of airlock before entering the most sacred part of the Taj Mahal, there are three entrances, South, East and West. The gardens and the terrace are a representation of the plain of the Assembly, a pictorial vision of where the souls go according to the Moslem religion and who owns the Paradise, the Hell, but especially the weighing of the souls. This representation, which is purely symbolic, has been partially reproduced with the gardens and the terrace, which contains, it, the mausoleum, the mosque and the pavilion of the guests. 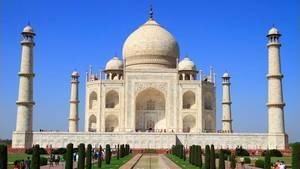 See on this subject the symbols of the Taj Mahal. The Great Gate was therefore a passage between the terrestrial life, illustrated by the inner courtyard, and the spiritual life, represented by the gardens. Hence the need to purify the soul of those who enter Paradise by materializing the passage through an imposing gate. The interior of the main door is quite sober compared to the rest. Above all, the building is open to the four winds, it is not a closed building but rather a passage, so the visitor feels more like crossing than entering. The interior is composed of an octagonal hall, a very common form in the Taj Mahal. Four sides have a wide, high, pointed door, the other four are much smaller, with just a blind arcade and a window of the same shape. There are many decorations under the front door, they are white and like the rest of the building they are made of floral and plant motifs. The upper part is a kind of gallery punctuated with arcades. The ceiling is vaulted, it is undoubtedly the most beautiful architectural element here. 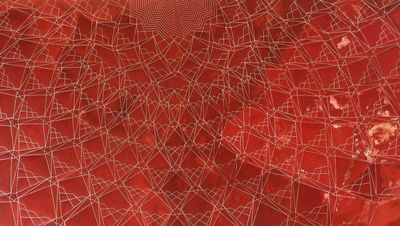 It is red with geometric patterns that focus on the top where all the motifs come together to form a kind of Sun from which a pendant luster.